New this year! 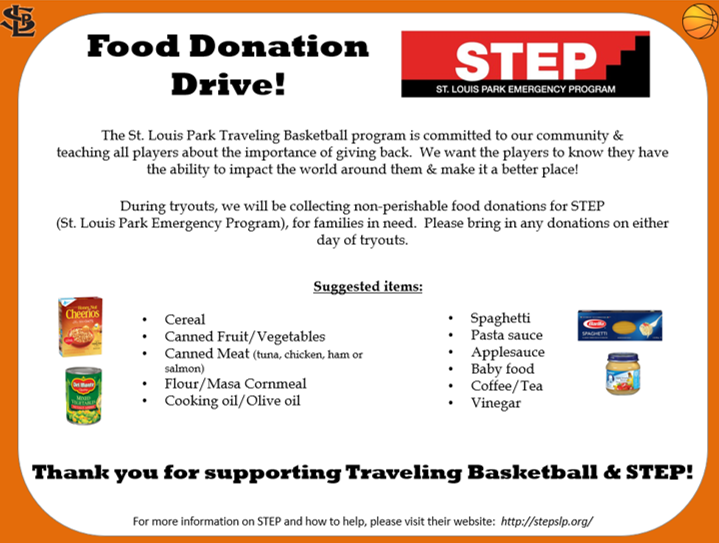 We will be hosting a food drive for STEP during tryouts! We encourage any family that is willing & able to bring a non-perishable food item on either night of tryouts. Donations will be collected & delivered to STEP on behalf of our program's families. We fully believe in supporting our community & giving back, and strive to instill these values in our players! Thank you in advance for your support! Thank you to all the players and parents who participated in our April 12th service day at Feed My Starving Children. Our shift filled, labeled, and packed 19,440 meals consisting of rice, soy, and manna. When the 90 boxes are shipped to Sudan later this month, our efforts will feed over 53 children for a year.